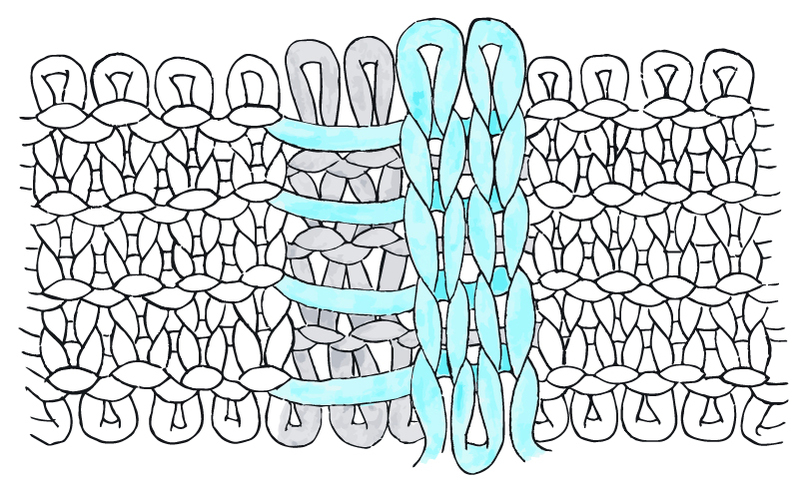 A tubular cast-on is a great way to start a project that begins with ribbing - it's perfectly suited to 1x1 (k1, p1) ribbing, and can also be adapted for 2x2 (k2, p2) rib and other arrangements. 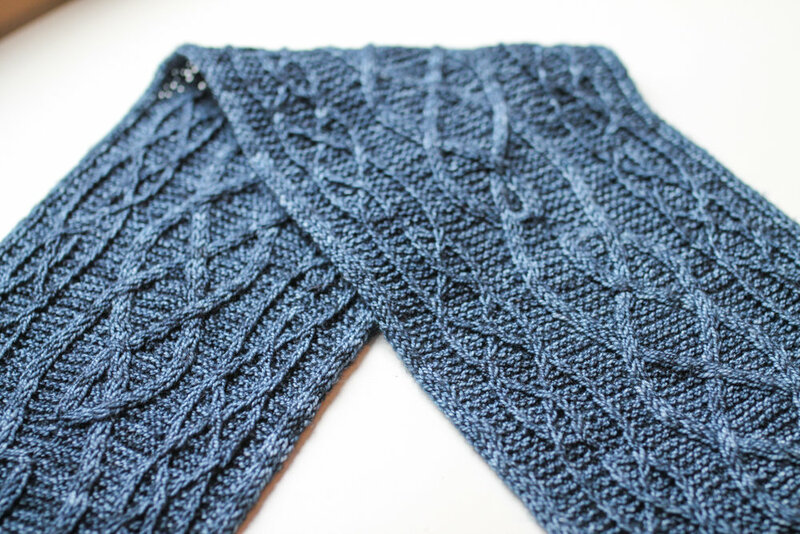 It can be paired with a tubular cast-off for a matching finish on both ends of an item; I decided to use this for my recently released pattern, the Bain scarf. there are a few different tubular cast-ons - the one I'm demonstrating here is the long-tail tubular cast-on. 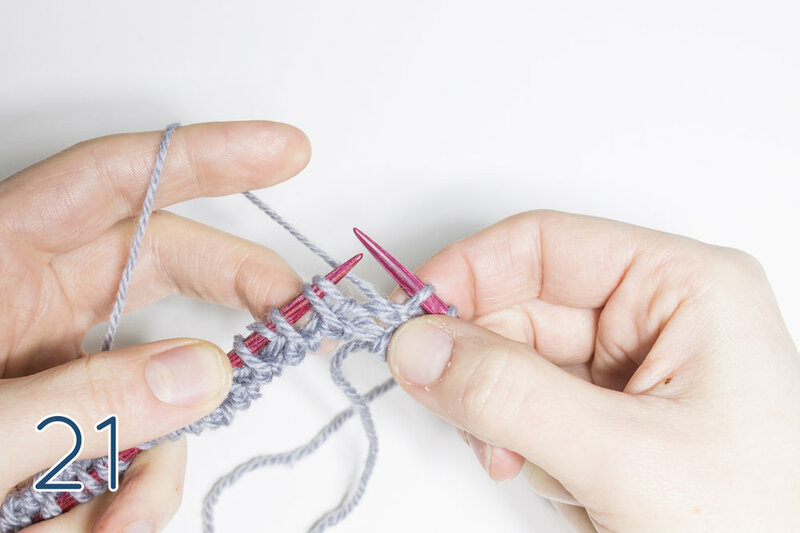 All of them achieve the same purpose, which is to cast-on invisibly in the middle of a row of stocking stitch fabric, then double-knit the top and bottom end of the fabric at the same time on the same needle. This creates a folded-over tube that sits neatly at the edge of the work. 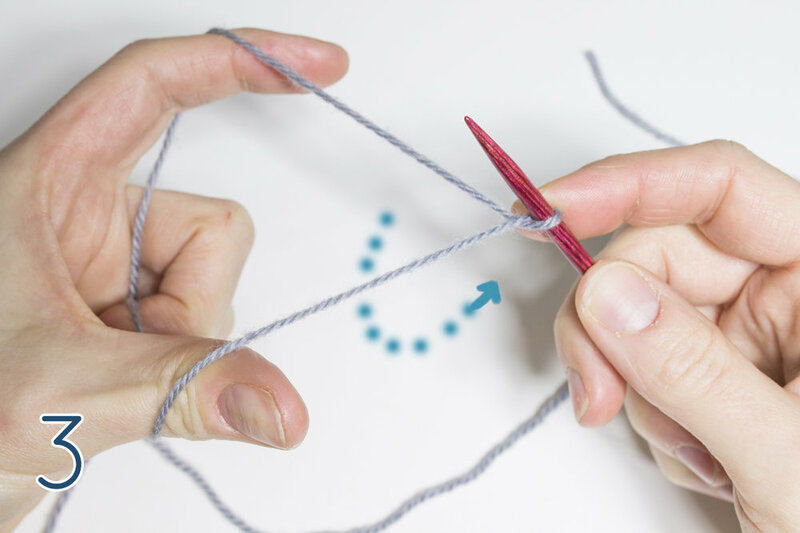 If this sounds confusing, I recommend this great post from TECHknitting which explains everything very well. 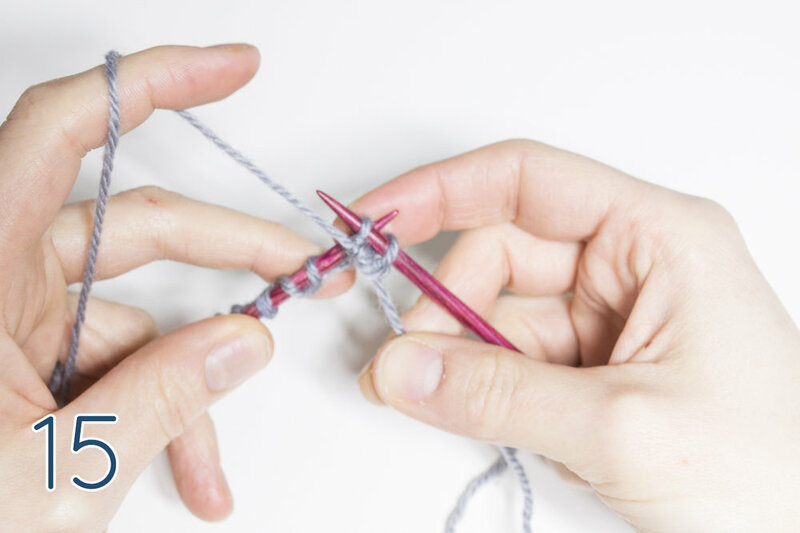 If you're feeling adventurous, you can try out the cast-on in a small swatch, then take it off the needles and unravel it - watching what happens as it unravels should help you to understand the underlying structure of the cast-on. 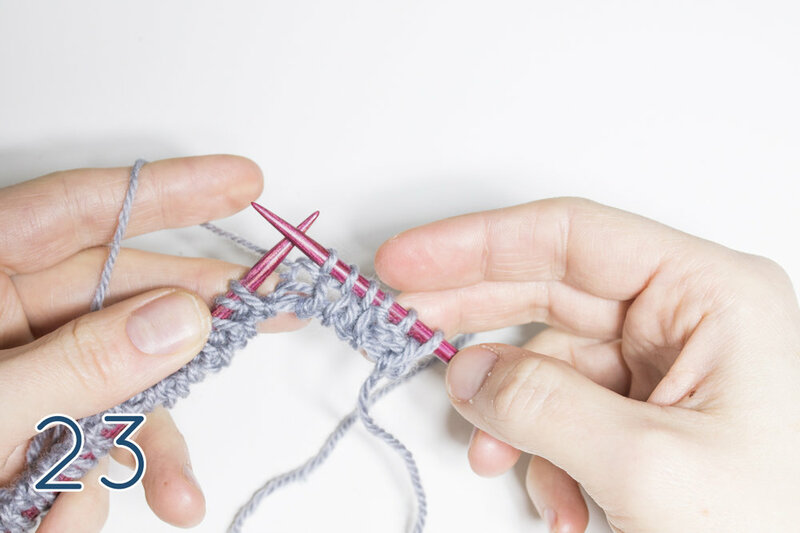 It's often advised to work the cast-on and foundation rows on a smaller needle than that used for your project, to prevent the cast-on from flaring out. 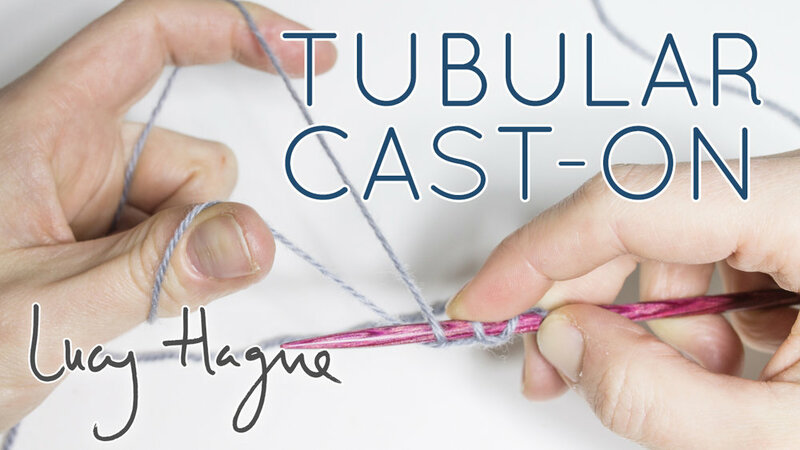 I personally haven't found this to be necessary, however it's worth experimenting and swatching to see if this improves the appearance of your tubular cast-on. Some tubular cast-ons require you to pull out the base yarn after working the cast-on - this one doesn't! 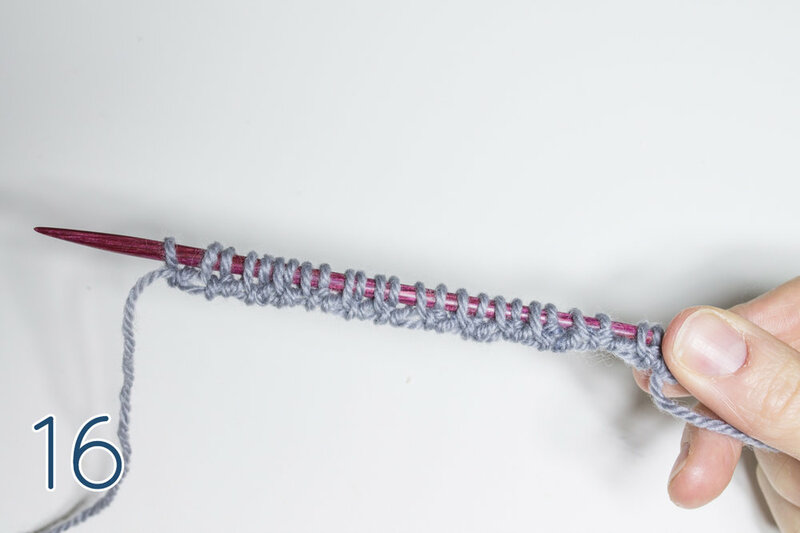 In this version, the working yarn and long-tail alternate to form each stitch in the first row of the cast-on, so pulling out the tail afterwards is impossible. 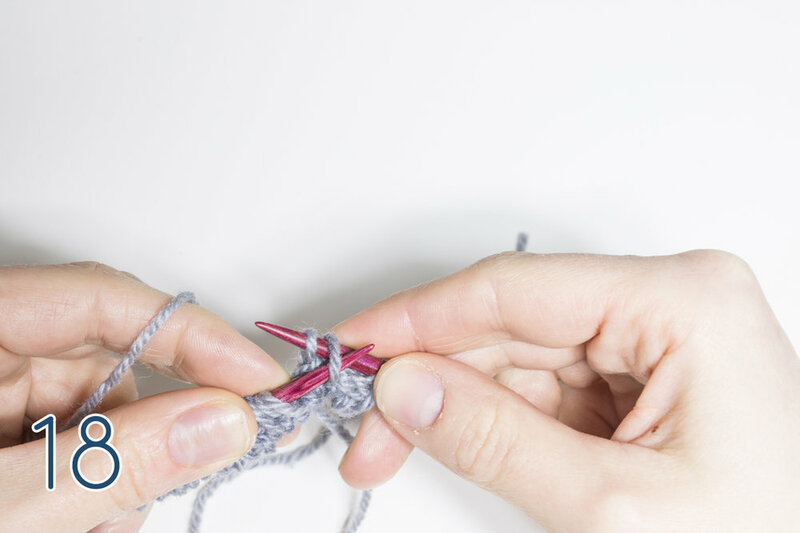 If you're casting on an even number of stitches, I recommend holding the yarn with the tail over your index finger; if it's an odd number of stitches, you can hold the yarn over your thumb. Doing it this way ensures that the very last stitch of your cast on will be worked with the working yarn, and not the long-tail - this doesn't really make much difference either way, but I find it helps to remind me to begin the foundation row using the working yarn, and not accidentally use the long-tail! Remember to leave enough length in your long-tail for the cast-on - you can use the methods you would normally use to estimate the length of the tail in a standard long-tail, for example, wrapping the yarn around the needle for the number of stitches required, or estimating the width of the project and making the tail 3-4 times as long as that. You might notice that this cast-on is very similar to the method I like to use for casting on provisionally (indeed, in the TECHknitting post linked above, a provisional cast-on is used and the waste yarn is pulled out afterwards). 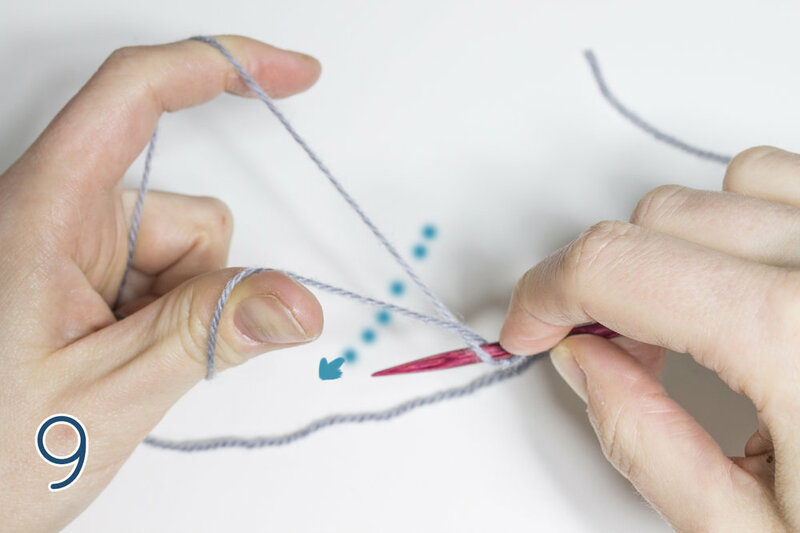 The only difference is that when casting on the even-numbered stitches, instead of leaving the yarn just sitting on the needle, you go one step further and scoop the needle over the front yarn and back under - this has the effect of alternating the stitches between tail and working yarn. 1. Begin by tensioning the yarn as you would for a long-tail cast-on - it doesn't matter so much whether the tail goes over your index or thumb, but as mentioned above, for an even number I like to have the tail over my index finger (so, the tail yarn here is the back yarn, over my index finger, and the working yarn is the front yarn, over my thumb). 3. 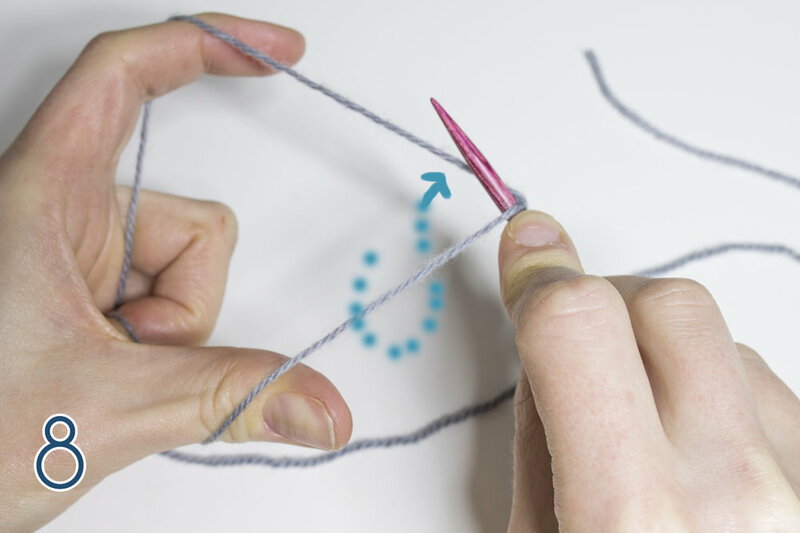 Bring the needle under the front yarn and bring it back up above, so that you have one loop on the needle with a twist in the yarns. 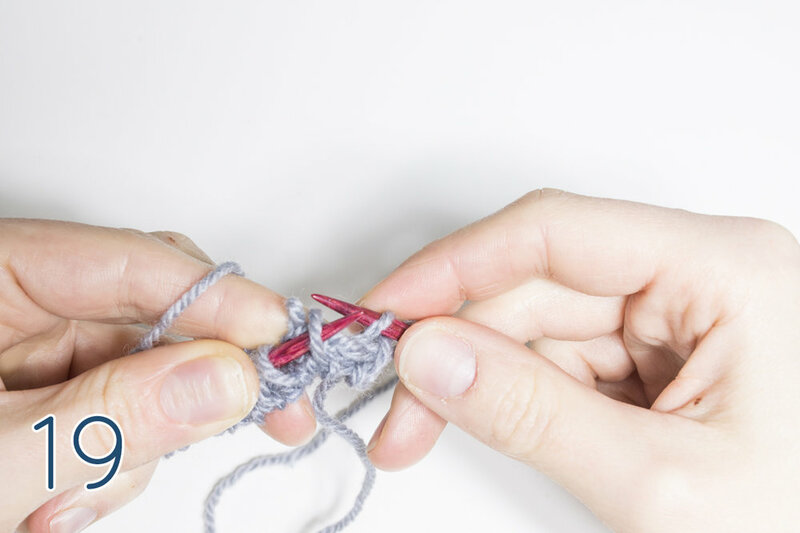 This is the first stitch - remember to keep a hold on it with your index finger to prevent it shifting around. 6. ... and scoop under both front and back yarns, to bring the needle back up above both. This is the second stitch cast-on. 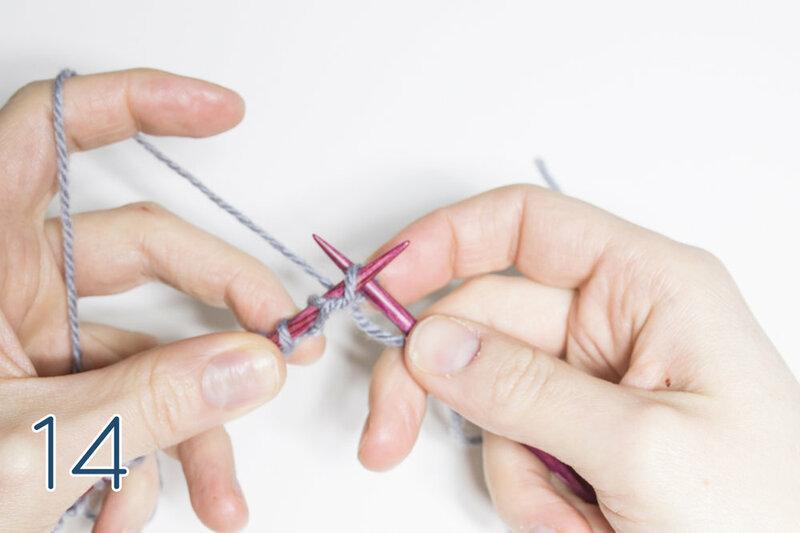 As for the first stitch, it's important as you're working to always hold on to the last stitch cast-on, with your index finger (this keeps it in position as you're moving the needle). 9. ... then scoop under both back and front yarns, to bring the needle back up above both. 12. Turn the cast-on around to begin working the foundation rows. 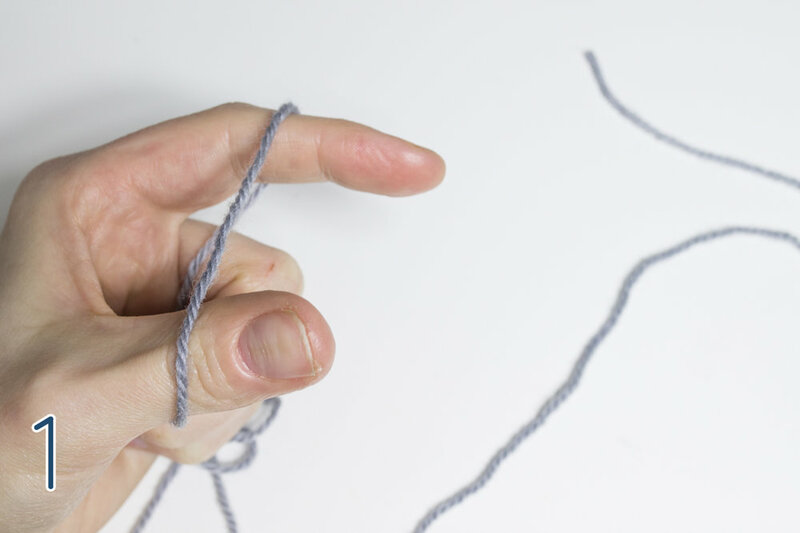 You need to do this really carefully, so that the last stitch doesn't fall apart (because the working yarn and tail yarn aren't joined together, they're just twisted once around each other). 13. 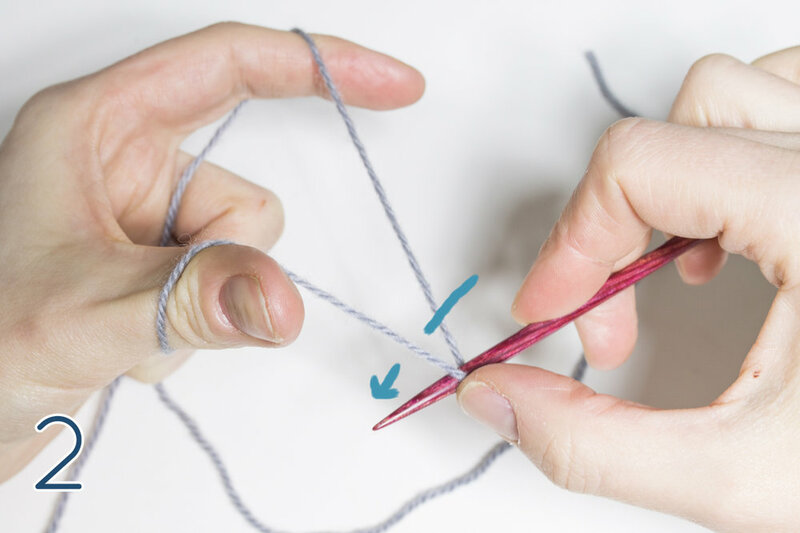 Carefully check that you have your working yarn ready to knit with (it should be the same yarn that was used to make the last stitch). 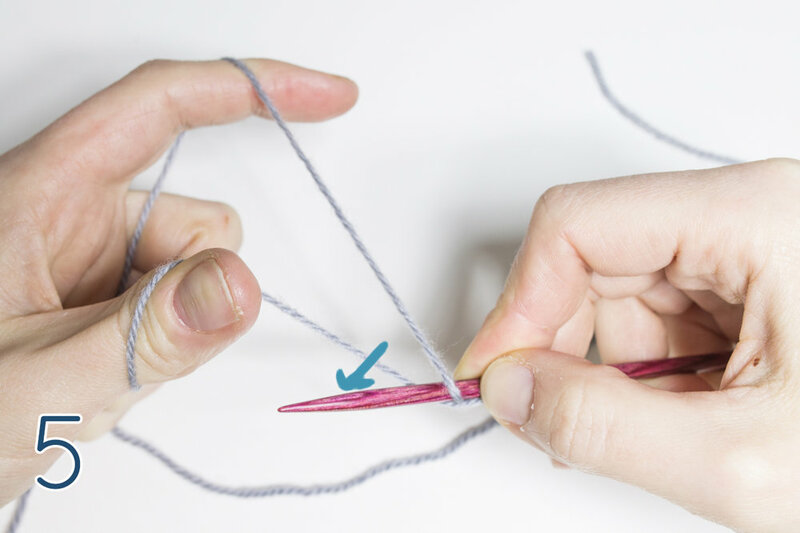 It's very easy to accidentally start knitting with the tail by mistake (something I've done more often than I'd like to admit...), so double-check to be sure! (here I'm holding the working yarn in my left hand, as I'm a continental knitter). 14. Knit the first stitch. 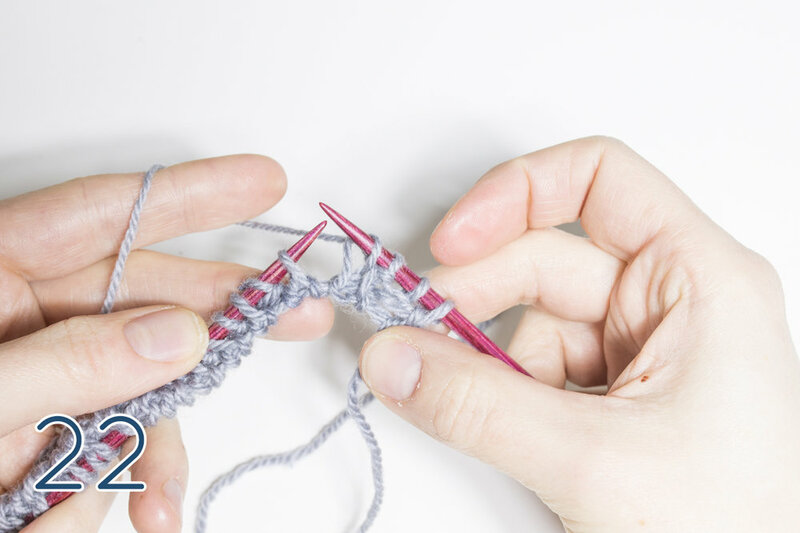 Note that on the very first row, the knit stitches will be oriented backwards (with the right leg of the stitch at the back of the needle, and the left leg of the stitch at the front). 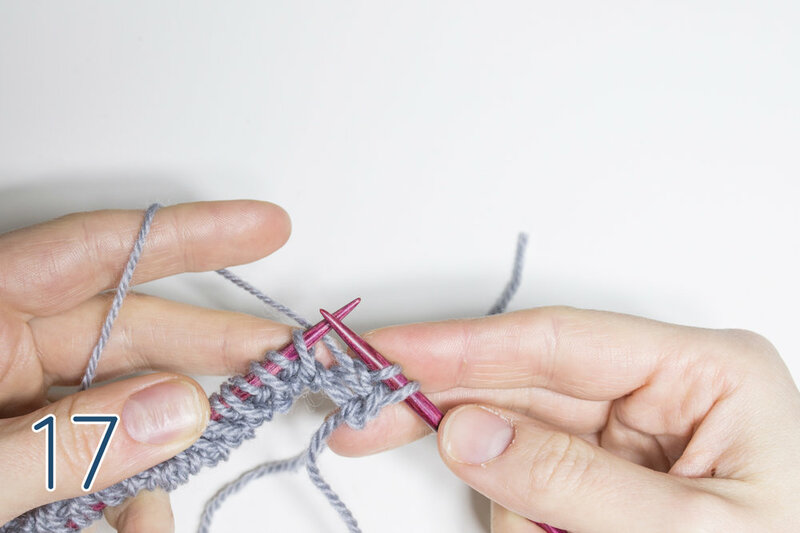 Just be aware of this and make sure you're knitting into the stitches so that they won't be twisted (i.e. 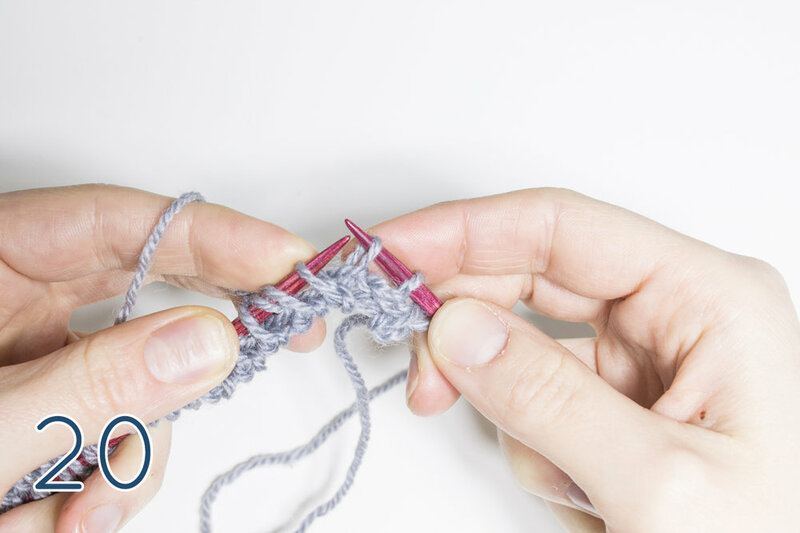 make sure the right leg of the stitch is on the right and the left leg on the left, as you insert the needle). After this, work the next foundation row in exactly the same manner (k1, sl1wyif to end - this time the knit stitches will be oriented correctly). You should notice that on this row you're knitting the stitches that were previously slipped - and slipping the stitches that were previously knitted. 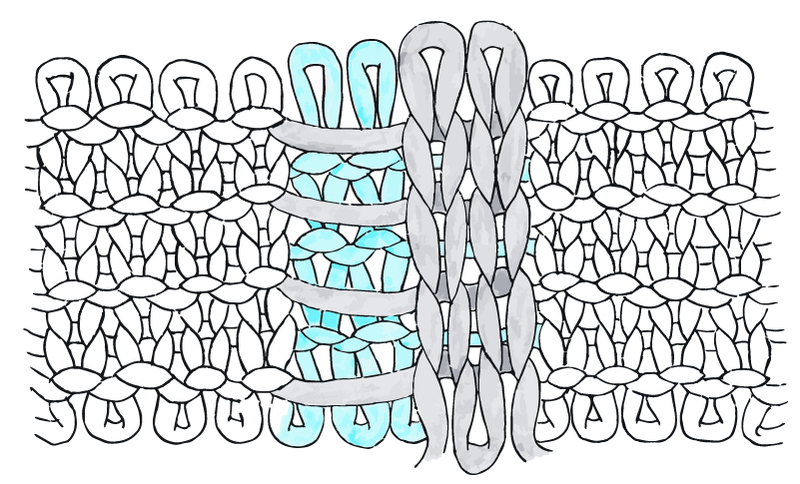 This creates a double-knitted fabric (if you're not sure of what this means, it doesn't matter - it's just an interesting thing to know!). You can work another 2 additional foundation rows, for a total of 4, or just 2 foundation rows. 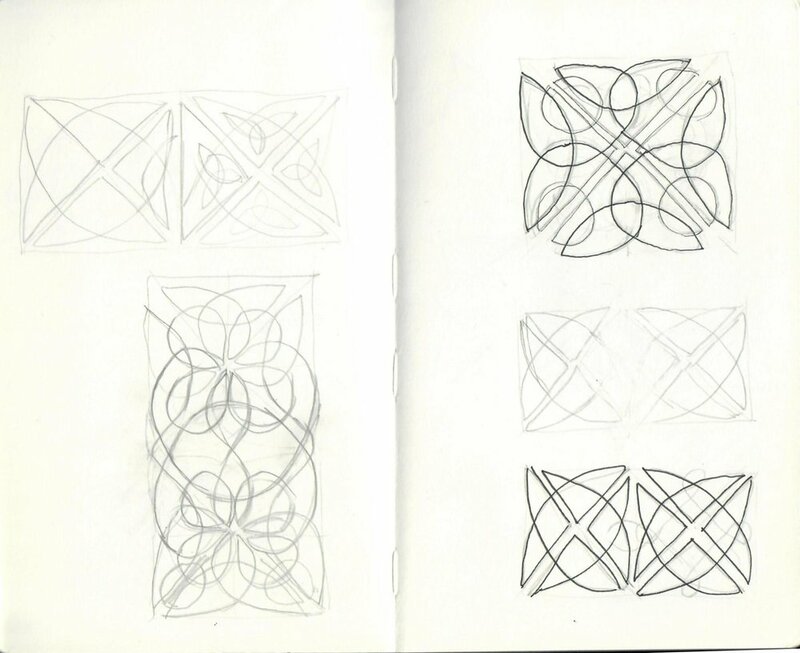 After this, you can continue however the pattern directs. If you're working in 1x1 (k1, p1) rib, you should be able to see how neatly the foundation rows will transition into ribbing - just k1, p1 over the stitches that were previously k1, sl1wyif. If your ribbing is going to be 2x2 rib, or some other variation, you will need to do a small amount of rearranging, just so that everything lines up neatly. 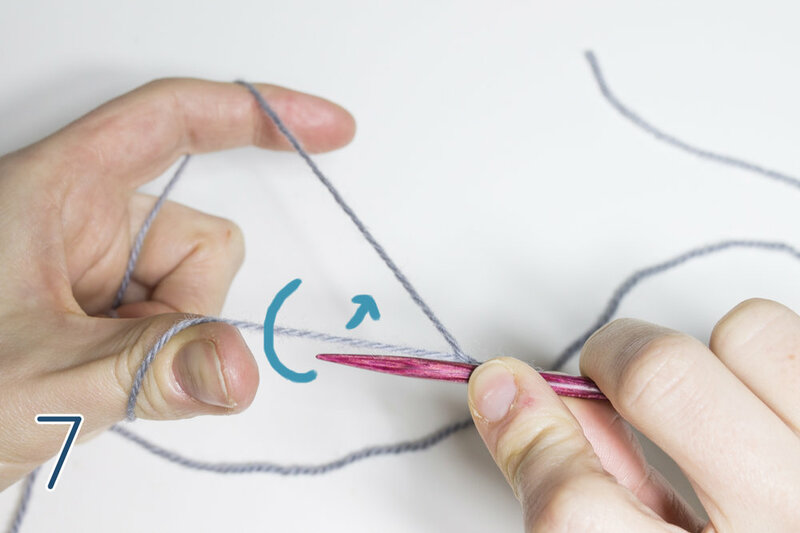 The exact way that you do this will be different according to the order of stitches in the rib - here I will demonstrate how to rearrange for a (k1, p2, k1) 2x2 rib. 17. 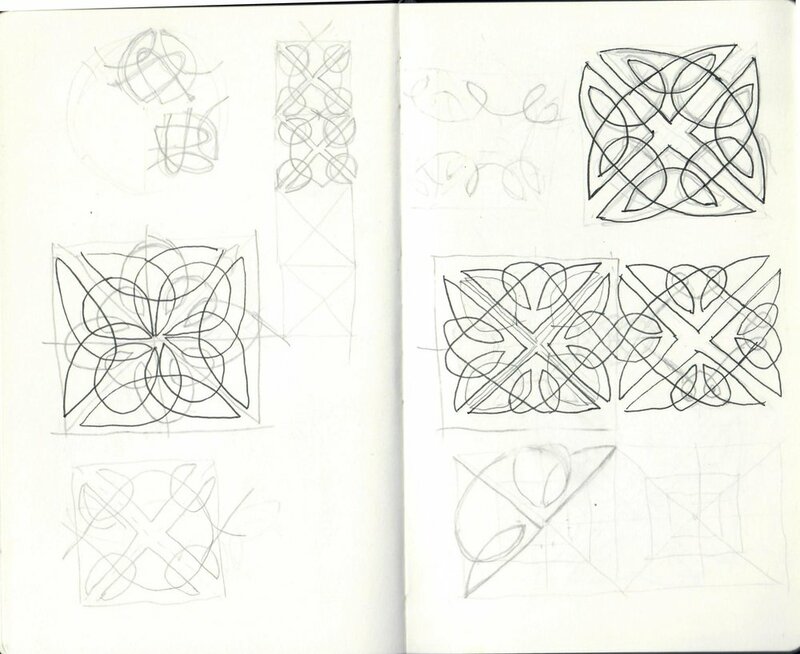 As I want the rib pattern to be (k1, p2, k1) I can k1, p1 the first 2 sts as they are, because they already fit into this pattern. However, if you look at the next 2 sts on the left needle, you can see that it's a k stitch followed by a p stitch. So I need to rearrange the stitches so that the k stitch crosses to the left over the p stitch - this way I will be able to p1, k1 over these stitches. This is a basic cable, which I term as a T2L. 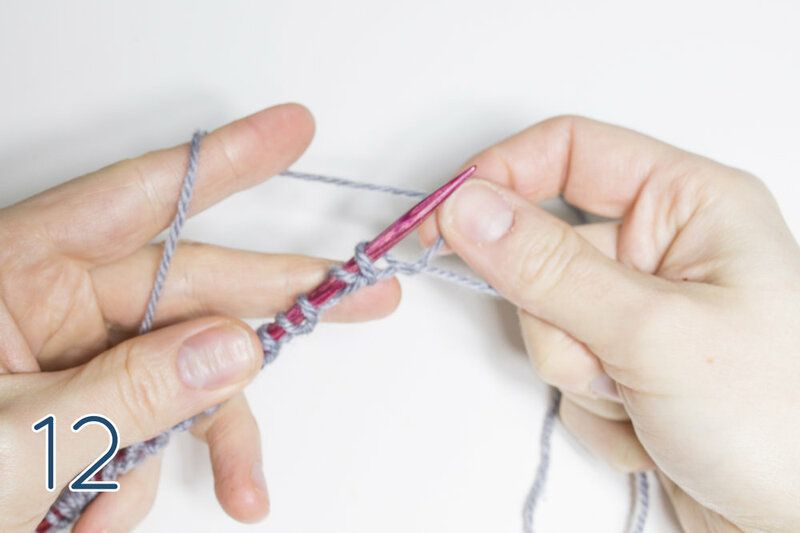 Here I'll demonstrate how I do this without a cable needle (if you want to use a cable needle for this, you would sl the first st to cn, hold to front, then p1 from ln, k1 from cn). General disclaimer - my method of cabling without a cable needle may be a bit weird, I think there's probably a simpler way of doing this T2L with less steps. 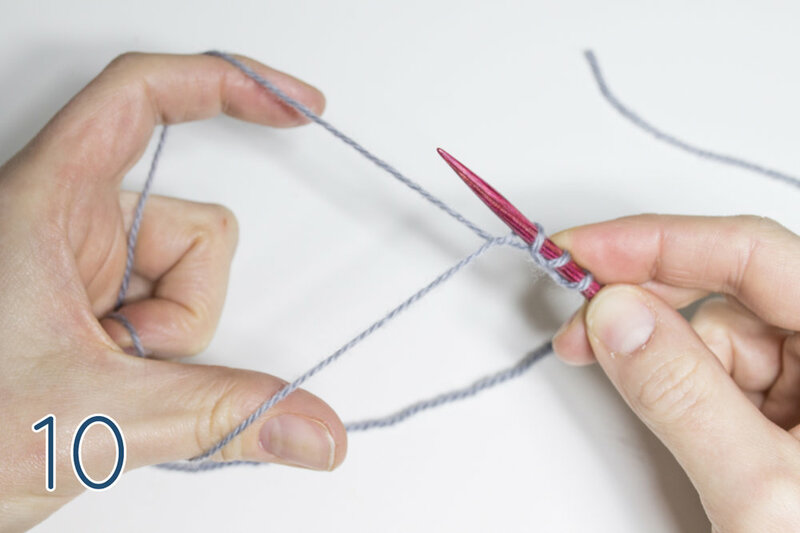 Personally I like to slip all the stitches to the right needle first, then rearrange them as necessary and put them back onto the left needle to work them in order. It's a habit I've developed out of working very complicated cable stitches, where I like to check everything's in the correct order on the left needle before I work the stitches. 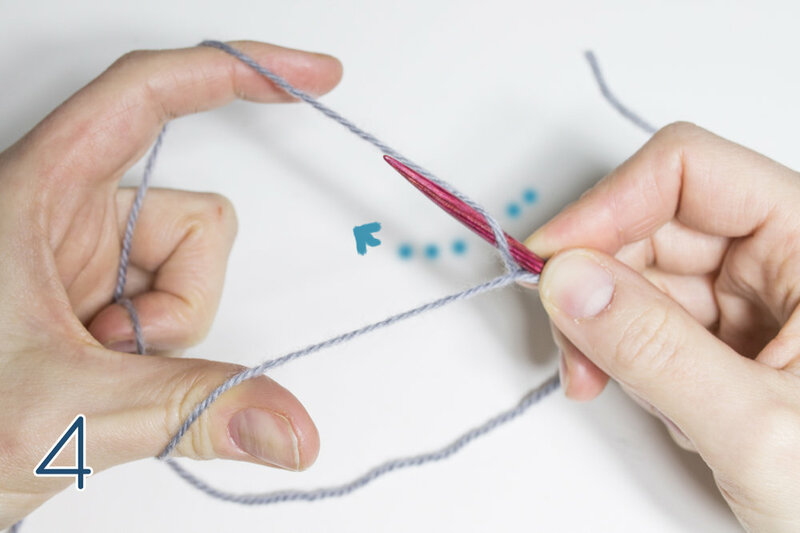 So if you have a different way you prefer to do a T2L (one k st crossing left over one p stitch), just ignore the next bit and work the cable whichever way makes sense to you! 18. To work the T2L without a cable needle, I've slipped the next 2 sts on the left needle to the right needle, then inserted the left needle into the second stitch now on the right needle (which was the first stitch to be slipped). 21. ... and transfer it back to the left needle. This has swapped the order of stitches on the left needle, so that now there's a p stitch followed by a k stitch. 23. The next 2 sts on the left needle fit the pattern, so I can k1, p1 over these without any rearranging. For the next 2 sts after that, I'll need to do another T2L. 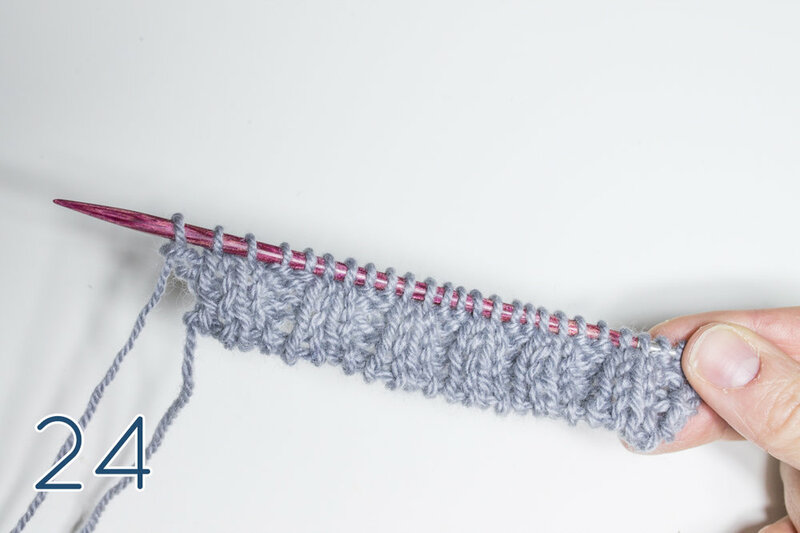 This can be repeated across the row to rearrange the stitches - (k1, p1, T2L) to end. 24. After this intial row of rearranging the stitches, I can continue in the rib pattern as set. Here it is after a few rows have been worked - you can see how the cast-on neatly flows into the rib, and how the stitches appear to smoothly wrap around the base edge of the fabric. I've made a series of short video clips illustrating different stages of this cast-on (by default, these should be hidden, to avoid distraction - you can view the clips by clicking on the description for each one, and hide a clip by clicking its description a second time). I hope that this tutorial was helpful! 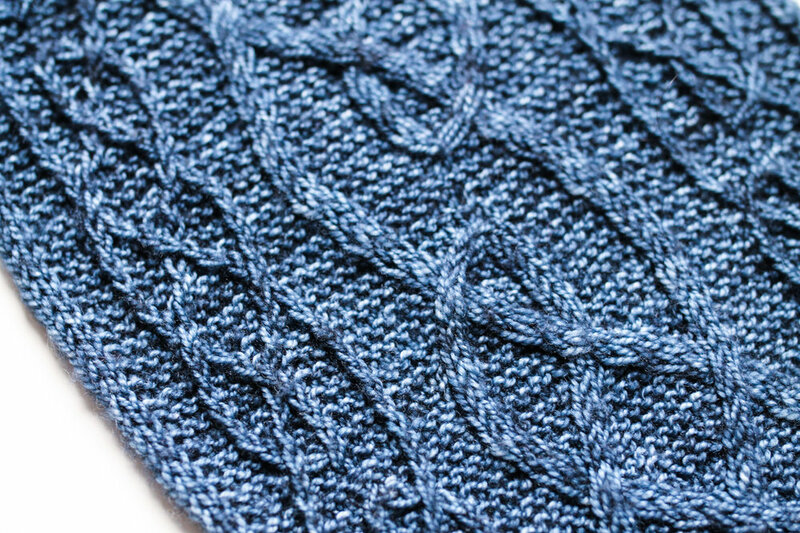 I'll shortly be releasing an accompanying tutorial for the matching tubular cast-off. P. S. Nearly forgot to mention - the needles I'm using here are wooden 5″ lace-tip interchangeables from DyakCraft (I'm not affiliated with them in any way, just wanted to share as they are so gorgeous and unusual, and I know some of you will be wondering where they're from!). Sadly they are quite hard to get hold of these days, but occasionally new wooden tips are posted on their Turnings page. I love wooden needles but it's so hard to find ones sharp enough for my liking - these ones are definitely the best I've found! We will be having an official book launch for Illuminated Knits at Kathy's Knits (Broughton Street, Edinburgh) on Thursday 26th October, from 5pm to 7pm - everyone is welcome to come along! We'll have all the samples on display and I'll be signing copies of the book and talking about the designs. Hope to see you there! 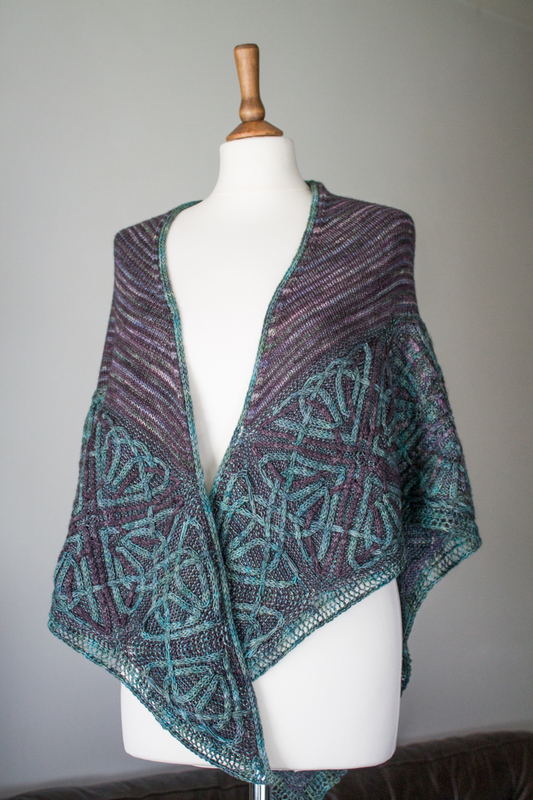 It's been a while in the making, but I'm pleased to announce the third design in the Illuminated Knits collection is finally here - the Durrow shawl! This design took several months to conceptualise and bring into reality. I think it might be fair to say that it's the most complex design I've ever created - both in terms of the cable pattern itself, and the knitting required to achieve it. I'm very happy with the end result though, and glad that I persevered even when it was completely refusing to make sense! 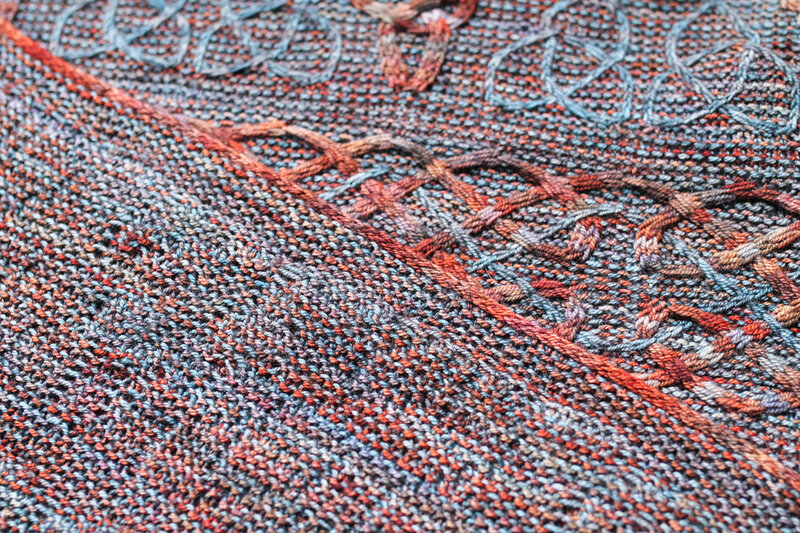 In keeping with the other designs in the Illuminated Knits collection, Durrow uses a technique of cables mixed with slip stitches to create a contrast colour design - I love this technique, because it gives you the chance to play around with different colours without actually having to use stranded knitting or intarsia. The colour-work is as simple as striping the colours on each round, and remembering to slip stitches when necessary (like mosaic knitting). This is the technique that I also used in the Iona blanket and Lindisfarne shawl. One slightly finicky thing about this technique is that it does draw the fabric in a little bit (vertically, because of the slipped stitches), and so the fabric becomes much denser as a result. Because cable knitting also a tendency to do this (particularly the type of complex cables I use, where the rate of horizontal travel can be quite extreme), I decided to only use this technique when working in the round. Why? Because when you work in the round, you can change colours on every round, so the contrasting stitches only need to be slipped over one round. 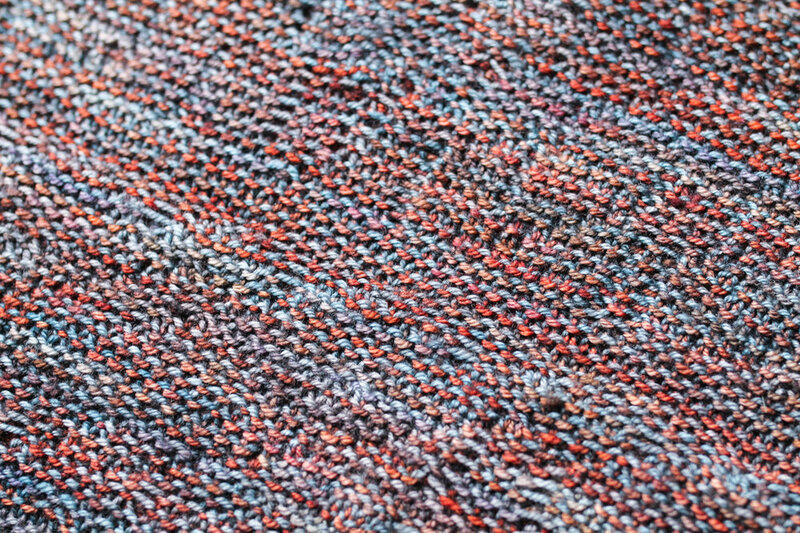 When you use this technique whilst knitting flat, you can only really change colours every 2 rows (so that your yarn ends up in the right place to strand up the side), so the contrasting stitches have to be slipped over 2 rows instead - creating even more pull-in and a denser fabric (there are ways of getting around this, so that you can knit flat whilst changing colours on every row, instead of every other row - however this is a bit complicated to describe and not something I wanted to do throughout an entire design; I have used it a little bit in this pattern though... more on that in a bit!). Also, you can see in the above photo how I've used slightly different colours for the background yarn of each square; this creates a nice gradient-type effect, and is one of the fun possibilities that arises from working the border in a series of modular squares. However, I think the border would also look lovely with only one background colour (the main reason I used three was simply because I couldn't choose between them!). 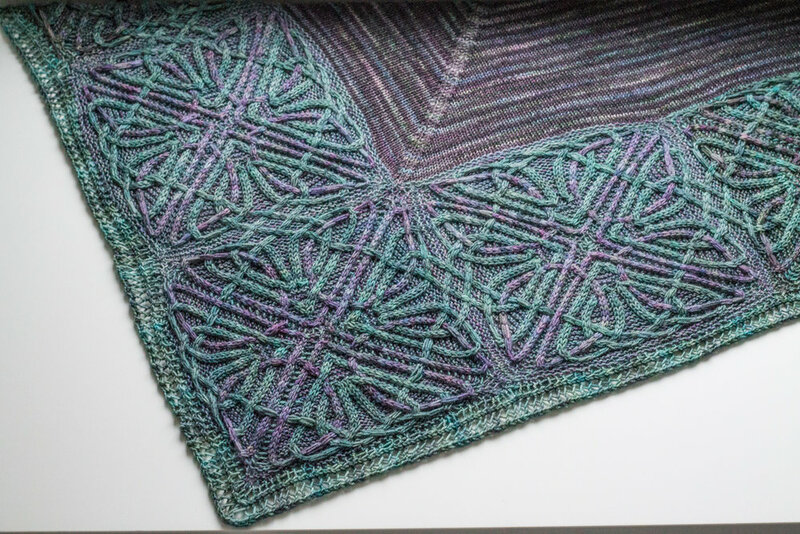 After spending so long on perfecting the design of this shawl, I felt a sense of melancholy (mixed with a bit of relief!) when I cast off the last stitch. 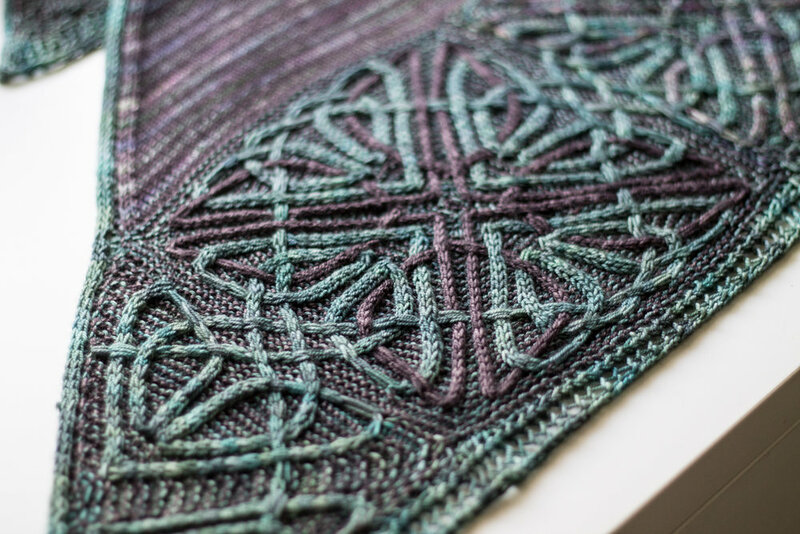 It always feels a bit strange to finish such a large and complex project, but I'm looking forward to diving into my next (and final) Illuminated Knits design. 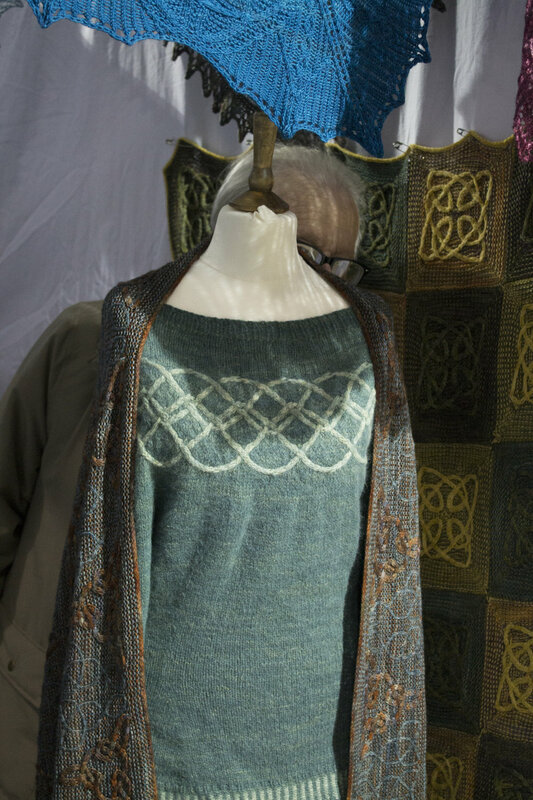 I will be exhibiting the sample of Durrow (along with most of my other knitted samples!) 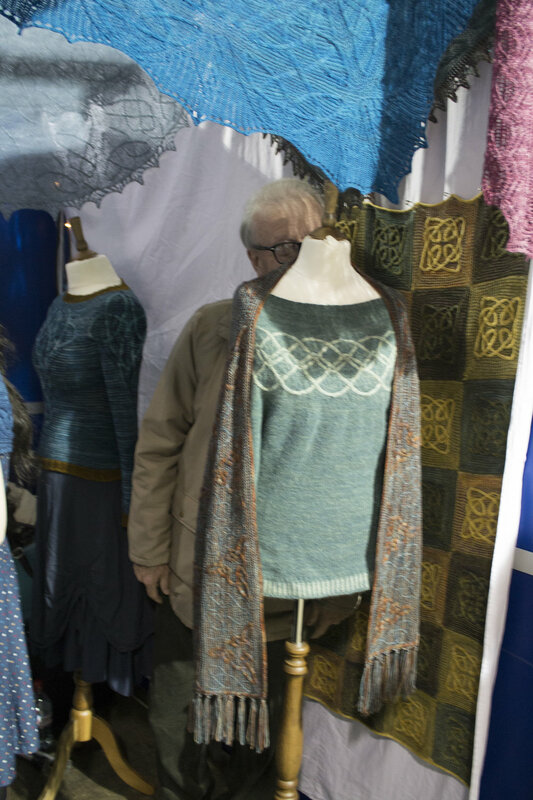 at the upcoming Edinburgh Yarn Festival (March 10th and 11th). I'll be at stand J1 in the marketplace, so please come and say hi if you see me!